When a person starts to profoundly lose their vision, there are a number of resources available to help them physically adapt – like how to navigate the city using a cane or a guide dog. But what about their mental well-being? Kathleen Forestell from the University of Toronto’s Class of 2016 wants to ensure those resources are there. The 29-year-old from Ottawa, who is receiving her MEd in counselling psychology from the Ontario Institute for Studies in Education (OISE) on Tuesday, says she believes the mental health of people undergoing dramatic life changes needs to be addressed. Forestell wants to be an advocate for Canadians with disabilities. She is one of more than 4,600 students graduating this fall from U of T. From Nov. 7 to Nov. 9, the university will award undergrad and graduate degrees to students from all three campuses. When combined with spring convocation, U of T’s Class of 2016 is more than 18,000 strong. 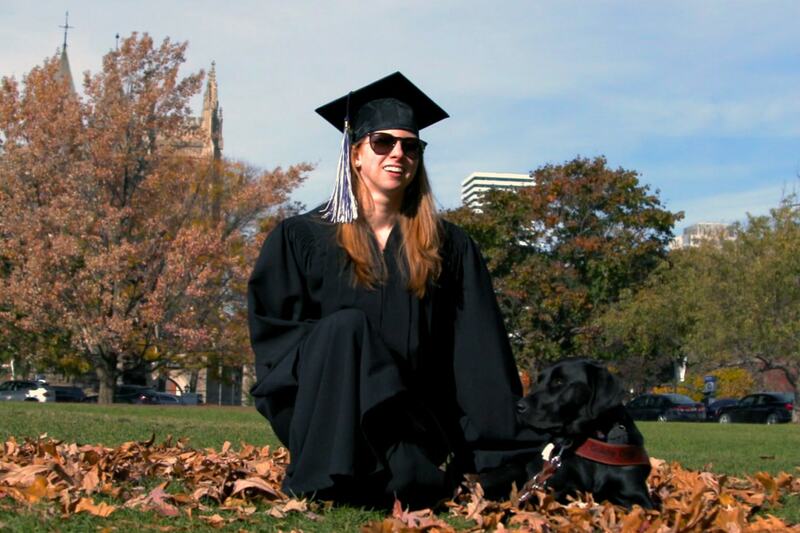 Helping Forestell take her final steps as a U of T student across the stage at Convocation Hall will be her guide dog, Tiffany, a two-year-old black Labrador retriever. Being a mental health advocate for people learning to live with disabilities is not an academic discussion for Forestell, it’s a lived experience. Two years ago, after moving to Toronto to pursue her postgraduate studies, her vision dramatically worsened. “It was just like ‘great timing,’” Forestell explains. Legally blind since birth, the former Canadian Para Alpine Ski Team World Cup racer has fearlessly zoomed down the slopes of the Matterhorn and was once clocked at 100 kilometres an hour as she crossed the finish line — relying solely on her skills, confidence and a ski guide. With just 20 degrees of peripheral vision, she excelled as a top athlete. Losing more of that field of vision has been a staggering loss — especially as she adjusted to life in a new city and university life. Her mother, who often came to visit, was a great emotional support and her professors at OISE found ways to accommodate her that didn’t involve vision fatigue. Recorded materials or talking books from the library helped her do research, but “the best thing ever” was the decision by one prof to allow her to give oral presentations rather than write papers. Her vision has now stabilized, and she’s moved from using a white cane to working with Tiffany as she gets out and about in the city. She’s now job searching and looking for the right job to be an advocate for people with disabilities. The looseness of jazz improvisation is “like talking and having a conversation... just with instruments. It offers a lot of creativity and freedom,” says alto saxophonist Anthony Argatoff. Graduation is fast approaching but he and fellow graduands Victor Vrankulj (jazz bass) and Andrew Miller (jazz drums) are looking towards the future and the CD release party for their avant-garde/improvised music ensemble Bellwether4 in December in Hamilton, Guelph and Toronto. Why the Hammer and Guelph? Well, it turns out they have humming improv jazz scenes, says Argatoff. Much like where he hails from in Kelowna, B.C. On November 7, his family will be in the office to cheer him on as he officially receives his Bachelor of Music in Performance. He’s enjoyed the four-year jazz program so much his own brother (tenor sax) is now taking it, too, as well as a growing number of fellow Kelownians. “It’s a really special place. I’m just really grateful I came here,” says Argatoff. There is always a community of musicians at U of T ready to hang out and play “all the time” and the professors, who are professional musicians themselves, are always available to talk anytime and offer advice. “The faculty was outstanding with lots of one-on-one opportunities,” agrees fellow fall graduand and jazz guitarist Christopher Platt, who switched to U of T after studying jazz performance at Mohawk College with Vrankulj. For Platt (below), the path to jazz started when he first picked up a guitar at the age of 12. At first the blues had him in their grip with Muddy Waters, Buddy Guy, Jimi Hendrix, Stevie Ray Vaughan among his favourites. “But I just wanted to consume more and more music and jazz was the next obvious step for me. I just kept going deeper down the rabbit hole,” he says, naming American jazz guitarist Wes Montgomery as a strong influence on his playing. Now, he lists Brazilian jazz as his latest musical obsession. “So much of it is so sad and some is quite joyous. I like the sad stuff,” says Platt. Like Argatoff, he’s focused on finding gigs through his website and has several side projects on the go with various musicians around the city. “Toronto is the place to be in Canada [for jazz]. In the states, it would be New York... but New York just seems to be so... like Toronto on steroids,” he says with a laugh, noting a lot of people he knows have gone down to the Big Apple to test their chops. He may do it at some point, but he’s in no rush to leave the community network of musicians he’s built up here. Wenjie (Shirley) Wu has got her eye on the world. Originally from China, she’s a true citizen of the world after spending her teenage years in Japan and later moving to Canada at the age of 17. “After living in different countries, I’m interested in how different people and countries see and interact with each other,” says the trilingual Wu who speaks Mandarin, Japanese and English. It was that interest that drew her like a magnet to U of T’s Munk School of Global Affairs two years ago. And on Monday, she officially graduates with her Master of Global Affairs, which she completed alongside the Collaborative Master’s Program in Asia-Pacific Studies. “I really liked being here. I’ll miss our Munk school, which has such a nice environment,” says Wu, noting the impressive number of events Munk hosts where a roster of internationally respected thought leaders speak on pressing global issues. Her time at U of T has also been filled with hanging out with fellow classmates who are passionate and engaged in their studies, as well as a dream internship at the International Monetary Fund (IMF) where she worked on the Canada desk in Washington, DC. Although Asia has been her main area of focus in studies, her classes at Munk broadened her country interests with projects on Brazil, Bangladesh, Hungary, Mexico, Uruguay, Syria and others. At the IMF, she also had the chance to do work on Canada and Caribbean countries too. Munk also taught her analytical methods and practical management skills with an immersion in the latest thinking on global issues, which will be crucial in launching and sustaining her career as an international policy researcher. This adds to her practical work experience in the non-profit and higher education sectors and her BA in international relations and economics earned at the University of British Columbia. For the full schedule of #UofTGrad16 convocation ceremonies, visit http://www.convocation.utoronto.ca/events.